As architecture and construction become more and more green, residential buildings that significantly reduce energy use and incorporate other environmentally friendly features will hopefully become more common in our urban areas. 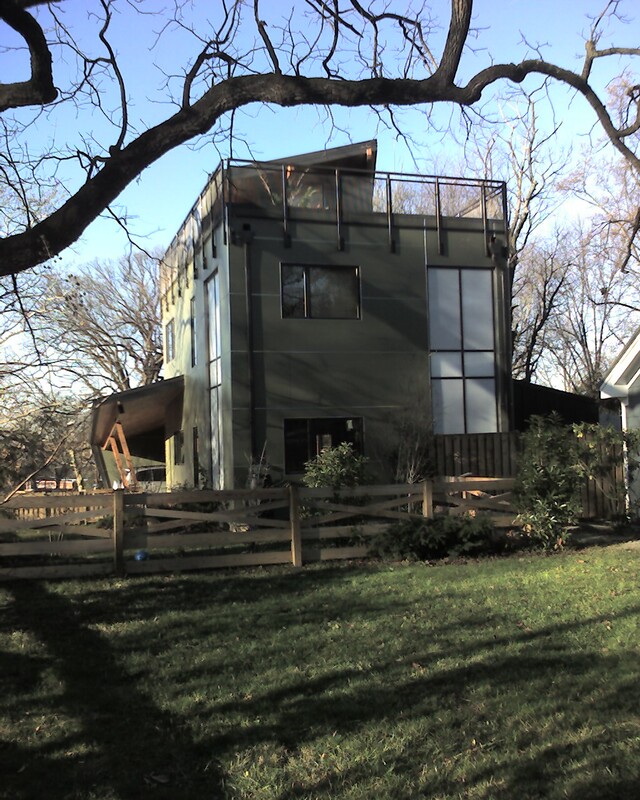 One builder in Arlington has created an innovative and effective green home in a residential neighborhood in the Westover neighborhood. Builder Patty Shields of Metro Green Home built the home depicted in the drawing here. It is the first home in Virginia to receive a LEED Platinum certification from the US Green Building Council (USGBC). This home was built on an odd-shaped lot that had not previously been built on. Due to its unusual triangular shape and small size, it required zoning waivers for setbacks and other requirements. As part of the overall project, Ms. Shields renovated the farmhouse next door, also incorporating significant green practices in order to gain approval from the county to develop this lot. This house incorporates a modern architectural palette, which is in contrast with the ubiquitous colonials surrounding it. Roger Lewis of the Washington Post recently wrote an article discussing modern architecture for residential construction, which is generally shied away from for a number of reasons he mentions--particularly risk aversion to change. In this case, I believe the builder has been sensitive to the community, created a more modern home while pushing the envelope a little toward integrating more modern ideas into traditional neighborhoods. 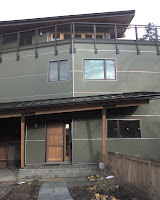 More significantly, she took a holistic approach towards the sustainability aspects of the house, incorporating better design, materials, systems and components in from the very beginning (for details and lots of photos, see her web site). The home is also located in a walkable neighborhood one block from a bus line that serves Metrorail and about a 20-minute walk to the East Falls Church metro stop. The earlier in the process sustainability is brought in, the more effective and less expensive it is to incorporate. Intelligently designed green construction can cost very little extra or sometimes no more than traditional building, and energy cost savings virtually always swamp any additional costs. Getting local governments to put more muscle into residential construction programs could be a very effective way to make environmental progress. Arlington has developed a Green Home Choice program to try to encourage builders to incorporate more sustainable practices in their new homes. However, it offers very little incentive: the only real one (and minor at that) is front-of-the-line plan review. Everything else is just informational or promotional. Commercial buildings, on the other hand, can receive significant density increases by meeting LEED certification levels. 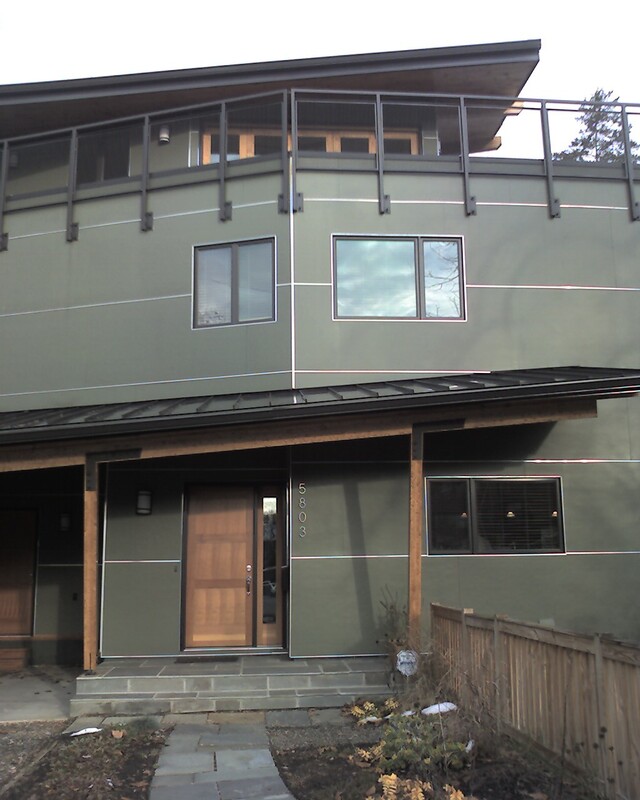 That said, Arlington's web site claims that they are reviewing the Green Home Choice program. Montgomery County has taken a different tack. In 2008 they passed legislation that would require all new homes built in the County, starting this year, to meet ENERGY STAR requirements. However, the County Energy Code has not been updated to reflect this, nor does the MoCo Department of Environmental Protection mention it on their web site. DC also incorporated new energy codes in January of this year, but has no specific residential construction program. Nor do Fairfax, Loudoun or Prince George's Counties, as far as I can tell. New construction is down due to the current economic conditions. That might make this the best time to develop effective new building programs, so that they are in place and operating when new construction picks back up.